Halloween is one of my favorite holidays, so you can only imagine my excitement to create and execute a nail design that screAms Halloween! I couldn't guess the amount of time I have in researching swatches, shopping for colors, deciding which colors and shades to use, and then trying to incorporate glitter, patterns, and a wicked fun treat--which ended up being my own hand-made nail decals! Of course, I have to point out that these are my natural nails (minus my pinky nail) in a somewhat-stiletto shape, with which I am thoroughly in love! 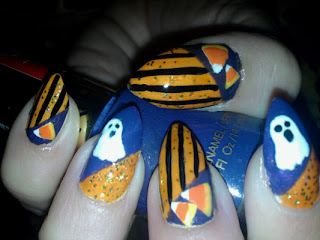 I did the background diagonal freehand, used a black striper for the stripes, and created the ghosts and candy corn using nail polish on a plastic bag and then cutting them out/peeling them off. I'll add a link later for this latter technique. And, the last step, applying the decals and top coat to get the finished result! I wish that I could have captured Hard Candy Beetle better. It's a very rich duochrome. See fab swatches of Beetle here on Polish or Perish. 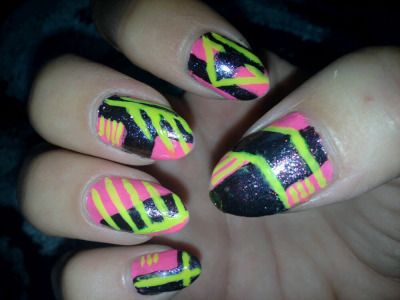 This design is probably one of my all-time favorites since each nail is different and each has a background design (in Pink Parka and Beetle) and then a top design (in neon yellow) based on the background design. 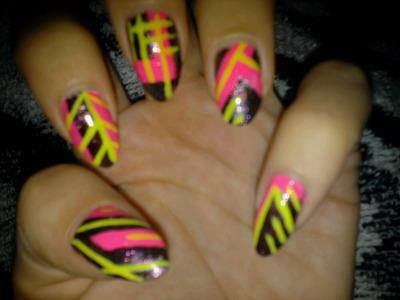 For the lines, I used a striping polish. A video on You Tube by Colette, "Crackle/Shatter Polish Comparison," shows some different ways of applying crackle polishes to achieve different effects (skip the first part and start the video 5 minutes and 50 seconds). 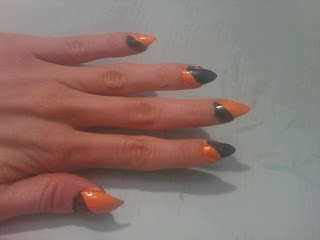 I tried a variation of the chevron application to get this above effect and used a decent amount of polish on my brush. You can see how my ring finger and index finger are slightly different; I used slightly more polish and thicker application of Silver Scale on my ring finger and less on my index finger. Funky Fingers polishes dry in a snap and generally have a matte finish, so this has a top coat. You'll notice the crystal on my pinky finger; I thought one was a nice touch but a crystal on each nail with this design and nail shape would just be...well...tacky. Polish or Perish is my new discovery, and she's batting a thousand tonight! 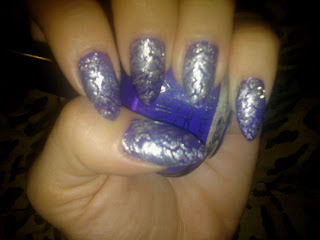 Check out her post on Kleancolor bottle pictures to see some of Kleancolor's best glitter polishes. No retailer around where I live sells Kleancolor polishes, and I just saw some swatches within the past couple of weeks. So, of course, I look up the Kleancolor website and am just overwhelmed by all the unique colors and glitters! These are gotta-have polishes! Don't get too excited at their $3 price tag becuase you'll compensate with shipping costs. 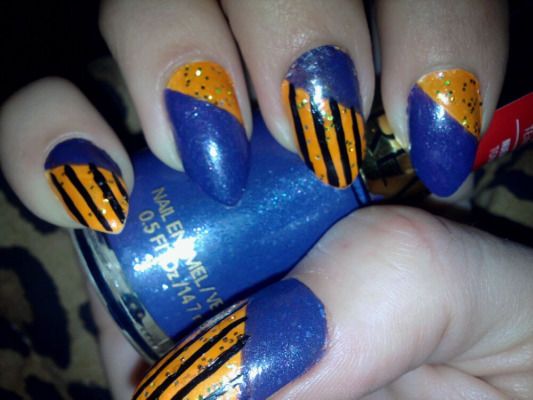 Last week I was at the mall, on a search for OPI's Spookette's during the last 30 minutes that the mall was open. I saw Halloween decorations in the dollar store, and decided to go into the dollar store and see if there was any fun Halloween jewelry, a decision that made me a little anxious and forced me to swallow my pride. Yes, I need to get over being a snob sometimes. Low and behold, I was very handsomely rewarded for my anti-snob efforts! Off to the side were 3 huge displays of nail polish. There it was, the very last display, 5 feet of Kleancolor polishes!!! After gasping and a brief survey of whether or not they had the glitter polishes, the next thought I had was, "Is a half hour enough time?!" I ended up only getting 10, sheerly out of feeling absolutely rediculous walking out of a store with more than 10 nail polishes. But, I'm slowly desensitizing myself and increasing my numbers! As if I haven't spent enough time on this one mani, there's one more thing to cover. I made these wedges using tape. Check out The Nailside for some phenom nail art, many of which use tape. This girl is good! 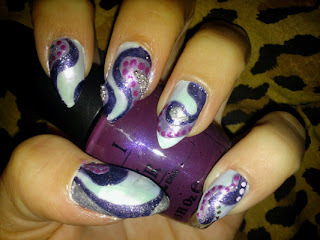 My favorite design is the V-gap Experiment, Part 2, but also check out her Explosion Design Tutorial, Katy Perry Mani, and rediculously awesome Outer Space Marble with loads of glitter and a matte finish. 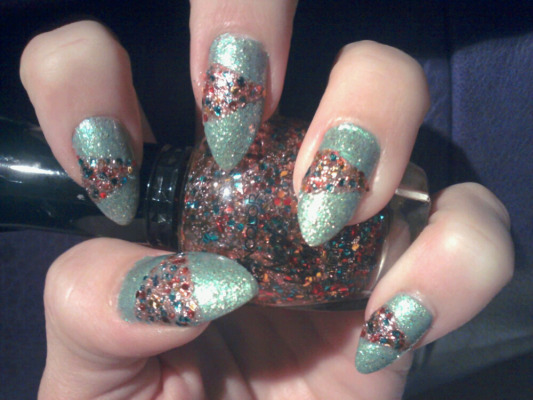 I used a bobby pin for the dots, and the rest was freehand with the polish that comes in the bottle. I used little silver beads on my middle finger. This nail design isn't fully complete, but shhhh...would you know if I didn't tell you? The blue is a duochrome with hints of pink/purple. It's a Maybelline polish that I bought recently and only afterwards discovered that Maybelline tests on animals, so I will not be purchasing any more products from Maybelline, no matter how gorg the product! The Nail Buff has a list of creulty-free polishes that do not test on animals, as well as ones that do. Some baddies that test on animals, along with Maybelline, are CoverGirl, Max Factor, L'Oreal, Lancome, and Dior. Several common polish brands that don't test on animals are Zoya, Kleancolor, China Glaze, Hardy Candy, Nubar, Color Club, Orly, Piggy Paint, Wet N' Wild, Revlon, Butter London, OPI for Sephora, and Deborah Lippmann. Yayyy!!! 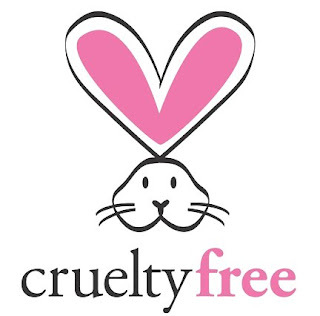 There seems to be some gray area (with Essie and especially surrounding OPI, see Never Unpolished for a letter from Coty, owner of Sally Hansen, OPI, and Rimmel), but here are companies that do and do not test on animals according to daily updated lists from Peta. Vegan Beauty Review also has a list of the top 12 creulty-free nail polishes (you'll see OPI on this list as well). There are so many companies that are anti-cruelty and hundreds of polish colors to choose from that aren't tested on animals. According to several sources, including The European Commission, the European Union has mandated the cease of testing ingredients for products on animals by 2013 or testing the final product on animals. Also included in this law is the prohibition of selling products in the EU that are tested on animals in other countries. In my last post, I mentioned 11 cores for efficient shopping, which should yield a great and workable wardrobe. I plan to elaborate on these cores over several posts; the picture below, which always makes my heart go pitter-patter, will identify the posts that are a continuation of "My Shopping Cores." For some added fun along the way, I'm also including pictures of drool-worthy closets. In this post, I delve into the first two cores, wearability and versatility. 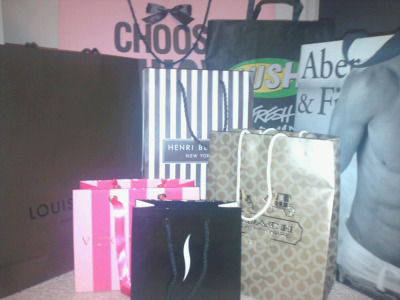 For each core, I provide examples that will hopefully better elucidate its concept, as well as some of my own shopping faux pas and the dire consequences. Hehe. Wearability refers to how likely you are to use the item in question. This overlaps with other cores (versatility, function, etc), but considers everything that would determine whether or not you would be likely to wear it. For example, you might find a sheer blouse that you love, but if you’re never going to wear it because it’s too see-through, its wearability factor is very low. It’s not worth the money or the closet space. For example, unless you’re an A-list celeb, RHWOX, or a pageant princess, gowns are very low on the wearability factor. I bought a gorgeous gown a couple of years ago at Daffy’s because it was one of those must-haves (or I thought so for some reason—I’m drawn to impact pieces) and it’s still lying around, never worn. Wearability has much to do with many factors, including your lifestyle. My main activities consist of going to class, shopping, dining, volunteering, and going out. The part of my wardrobe I wear and what I have focused on buying this past year has been sweats, tanks, sweatshirts/wraps, totes, flip-flops, platform slides, and boots (casual activities), along with cocktail dresses, clutches, and mega-high heels—very appropriate for my lifestyle. Other cores that particularly contribute to wearability are comfort, durability, and function, which I will discuss in another post. image from Voce "fez" o requisito?! Versatility can be viewed in two aspects: 1.) how well the item works for different occasions or purposes and 2.) how well the item works with other pieces in your wardrobe. For example, a pair of ordinary jeans works for a day at an amusement park, dinner, or a night out. They are highly versatile because they work in a variety of environments (aspect 1). You can also wear almost any top you have with the right pair of jeans (depending on the wash, fit, style, etc), which makes them versatile as far as how well they work with other pieces you have (aspect 2). I recently bought a bright yellow cashmere cami. It might be somewhat versatile as far as where I can wear it since I can dress it up or dress it down, but it won’t go with much of my wardrobe; it's highly versatile considering the first aspect and minimally versatile as far as the latter. Next up on my list of shopping cores for a great wardrobe are durability and aesthetics, followed by quality, function, niche, availability, comfort, cost, and maintenance. Sadly, these posts will appear over the course of several weeks, but they will come! And, trust me, they will be well worth it!! I'm hoping my cores will forever change your approach to shopping and the utility of your wardrobe, as well as your satisfaction with it!